Here at Team Thea we're huge fans of transportation "alternatives," although in eco-minded San Francisco biking and bus-ing can hardly be called alternative. In any case, we welcome any opportunity to celebrate them. Bike To Work Day is the perfect chance! 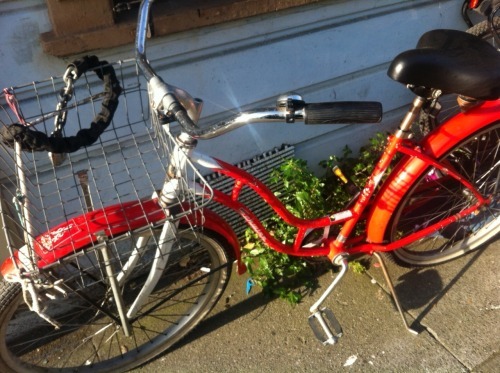 Check out the bike that got Thea to work on Bike To Work Day! The League of American Bicyclists estimates that there are over 13,000 bike commuters in San Francisco alone. Many of those intrepid souls rely on the Wiggle to get from Market Street to Golden Gate Park and points west. The Wiggle runs right through District Five, so needless to say we're going to want to hear from bike commuters — all thirteen thousand of you if need be — during this campaign. You can't quite see it, but Thea's wearing her Muni shirt in this picture — a nod to buses and bikes working together? Thea's firm belief in the benefits of alternative, sustainable transportation is a driving (no pun intended) force behind a lot of her work in the community. Get in touch with us if you've got opinions on the matter that you think we should hear!